You can view contest winners by clicking on the "CONTESTS Enter Contests Share & Vote" button that is at the top of of each page at ThriftyFun. This button will take you to the following page. 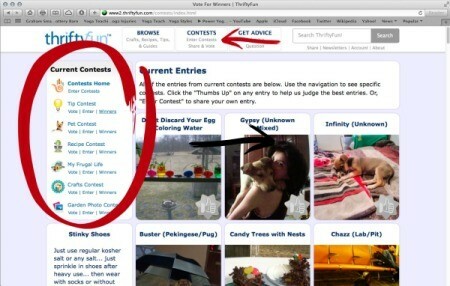 Each contest type is listed in the the side menu with a link to "Winners" underneath: Tip Contest, Pet Contest, Recipe Contest, Crafts Contest, My Frugal Life and Garden Photo Contest. This link will take you to the contest winners for that category organized by week. Generated 2019/04/18 10:25:05 in 90 msecs.